Oh and we have a bit of fun lined up for you too, but I’ll leave that to Tandy to explain! Hi, I am Tandy from Lavender and Lime. I live at the foot of the mountain which marks part of the Unesco World Heritage site known as the Kogelberg Biosphere. This area has the largest floral diversity world wide. The nature reserve covers 3000 hectares and is home to the cape cobra, tortoises, buck, frogs and wild cats. The R44 is the road that runs through Gordons Bay where I live, and it skirts the mountainside with the coast line next to it. From many vantage points along this route one can see whales and dolphins and on the rare occasion, a great white shark can be spotted. 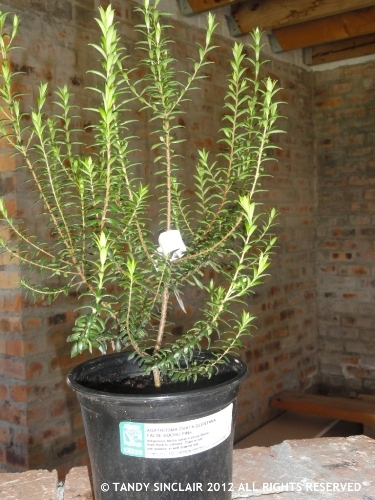 Fynbos grows freely here, with the Erica Protea being the most commonly known species. The area is a protected reserve and one cannot pick any of the flora off the mountains. However, having an indigenous garden is of great benefit. It needs very little watering and very little care. I am going to take you through a walk of my garden and introduce you to some of the fynbos species that I have growing. Geranium, or pelargonium as this funbos is known, comes in a variety of colours. This pink one is the only one flowering in my garden at present. These indigenous plants have been used in skin care since the mid 17th Century. To make a refreshing skin toner simply brew the flowers, stems and leaves in some boiling water (like you would for tea) for 5 minutes. Allow to cool and then store for use. To reduce inflammation and help heal wounds, soak the leaves in some boiling water for 5 minutes and then use as a poultice. For a facial steam treatment, to help with sluggish, congested and oily skin, simply place 4 drops of rose geranium essential oil into a bowl of warm water, place a towel over your head, close your eyes and lean over the bowl. Inhale the vapour for a few minutes and then rinse your face a number of times with the infused water. The next plant in my garden is a succulent which appeared out of nowhere. 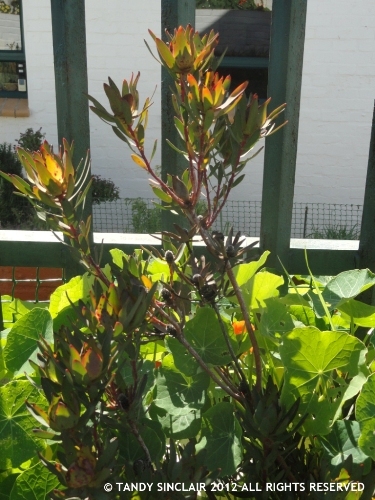 It is so pretty and I am hoping that it will survive being transplanted into my fynbos garden as at present it is in my vegetable patch. The leaves can be broken off and rubbed onto wounds to promote healing. I absolutely love my black eyed Susan vine which has grown wild into my planter. I originally purchased two of them but the orange one did not survive. They look so pretty and if anyone knows if they have a medicinal use, or culinary use, please let me know. And while I am asking questions, does anyone know what this is? The last fynbos I would like to introduce you to is Buchu. I bought this tiny plant as soon as Claire asked me to do a guest post, and hopefully in the future I will be able to show you how it has grown. The leaves of this plant are used to treat gastrointestinal and urinary tract problems. It has both diuretic and antiseptic properties. A tea infusion is made using the leaves or it can be purchased commercially in tea bags, often added to rooibos leaves. A tincture of the leaves and stalks is made by adding them to brandy. Buchu vinegar is a traditional remedy used in both a compress and taken internally. I hope you have enjoyed a visit to my garden and the glimpse into some of our beautiful and functional fynbos. Very interesting plants – thanks for showing us a few unknowns! The area where you live sounds amazing Tandy! How nice to meet you through your guest blog here! You have a wonderful climate and garden.. many of these plants we can only purchase and keep seasonally. Lovely! What an insightful glimpse into your garden, with vast knowledge, it seems, of the many possible uses for the plants. Pelargonium – always called geranium here – is a fairly common potted plant for window boxes or porches. It has to be overwintered in a cool basement, kept dormant for several months. Always seemed like too much work…but I never realized it was such a useful, healing plant! Thank you! Thanks for sharing your garden … all completely unknown for me – but I’m only an indoor and window ledge gardener. Really enjoyed this post. So strange to think of Pelargoniums as perennials. it must be the climate! What lovely plants and thanks so much for a peek into your garden! That plant you don’t know is a NEW GUINEA IMPATIENCE. I have one growing in my garden in the mid north coast of New South Wales in Australia. It grows easily from cuttings in the right season. Love that Fynbos. I have a South African Protea which is flowering at the moment, it is a lovely pink with black centre. I love that the fynbos will grow in NSW – maybe I should send one to my sister who lives in Syndey? 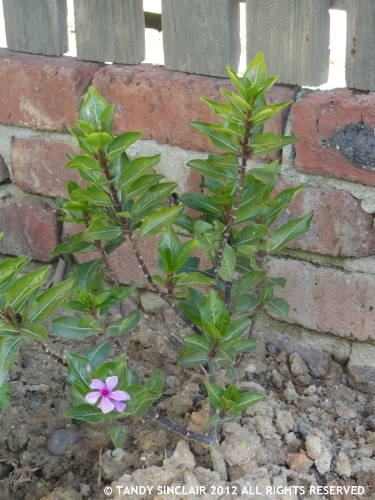 Thanks for letting me know what the plant is – I shall have to take a look with the laptop, as some people seem to think it is a periwinkle, and one friend says it is a black wattle which we have to remove as it is an alien. Thank you Tandy for your wonderful post: have heaps of proteas and pelargoniums here in the Southern Highlands of NSW, Australia, aboot 100 km S of Sydney. Climate supposedly ‘temperate’. I am actually not a huge fan of pelargoniums/geraniums, but haven’t you taught me a lesson re skin care: I can see a new toner/facial steam treatment on imediate horizon at no cost 🙂 ! Thanks!! Hiya Tandy, That is definitely a Vinca. I find if you cut them back in winter they will survive it and bounce back in summer. The only trick is you have to leave some leaves. HI Tandy, and what an interesting and beautiful garden you have. And I love the medicinal and skin care qualities that some of these plants offer…very cool. I was going to say that the flower looked like vinca we have in our yard, but ours is more vine like. Wonderful post! Lovely garden! The plant you are questioning looks like vinca to me. Hi Tandy – fabulous garden and great to see you here! 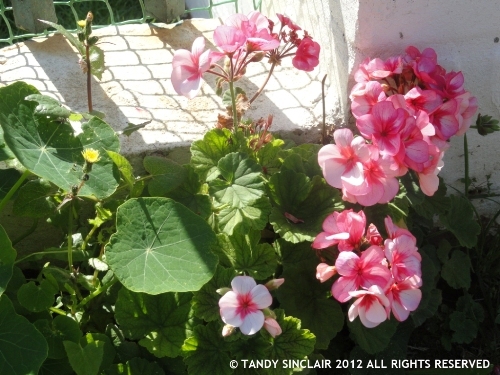 I love your garden Tandy, your plants are well kept and your flowers are gougeous (sunkissed!!). I’m a lazy gardener and the only plants that I remember to water are those that are edible…. PS I especially like plant which appears out of nowhere! 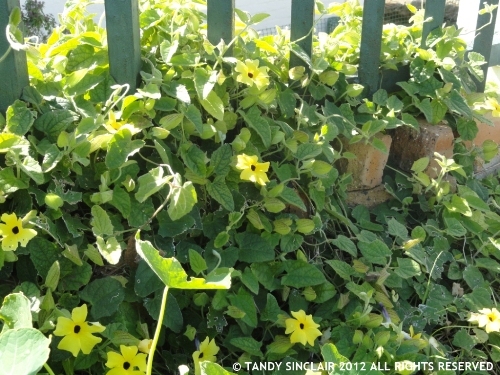 Tandy, how wonderful to peek into your garden! And such a different variety of plants to what we see here! Thank you for sharing! Your garden is beautiful. Thank you for sharing it and all the great information. I love geranium oil. It is so sweet and delicate. I didn’t know about using the plant as a skin toner by boiling as a tea. Mine are due for a prune so I’ll try that. me too, I’ve seen products with geranium oils and scents in before now, but of course me being me I just hadn’t thought of making it for myself, that is until Tandy came along ! 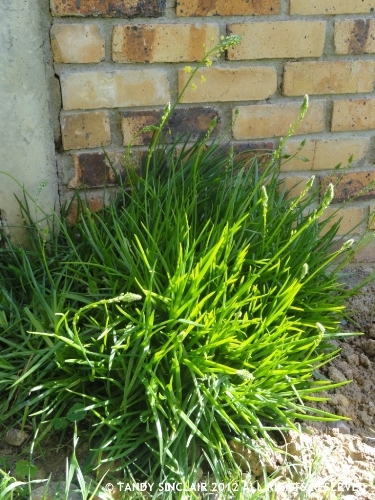 Thanks Claire for stopping by my garden blogging – I love South African plants and have some restios as well as many others than originated in S.Africa in my garden. But some are just too tender… so thank you Tandy for letting me some in their place of origin.